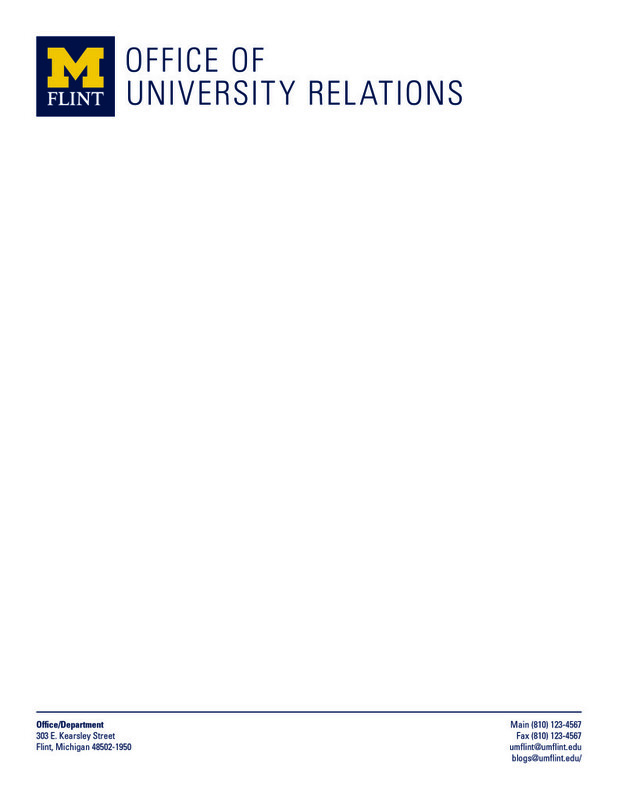 The moment you have been waiting for: new business card and stationery designs with UM-Flint’s updated logo and wordmark! Before you read on, please know that if you still have a stockpile of stationery with the old logo, please use it! Trees do not need to be sacrificed for the sake of the brand. This is a transition that should occur when your current stash of stationery is gone. We are pleased to offer new stationery and business cards with the updated logo. We know that some of you prefer to use the university seal. 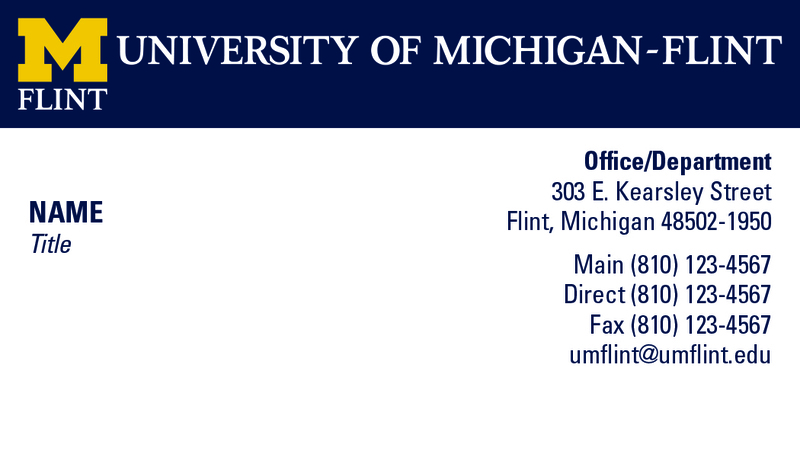 Please know that the seal can only be used for official University of Michigan Board of Regents’ actions. Even President Mary Sue Coleman has the university logo on her office stationery and business cards. The seal is simply not an option. The decision regarding the new stationery template options and layout were made in an effort to establish consistency with brand and to reduce issues with content layout. In addition, the below stationery compliments the overall branding efforts between all three University of Michigan campuses. This stationery will be available through Printing Services and eventually included in the online template system, PRINTsprokit by fall 2013. One template for business cards includes a two-sided option for either additional text or the logo. The business card was designed to allow for multiple lines of text within the contact information and employee title areas. 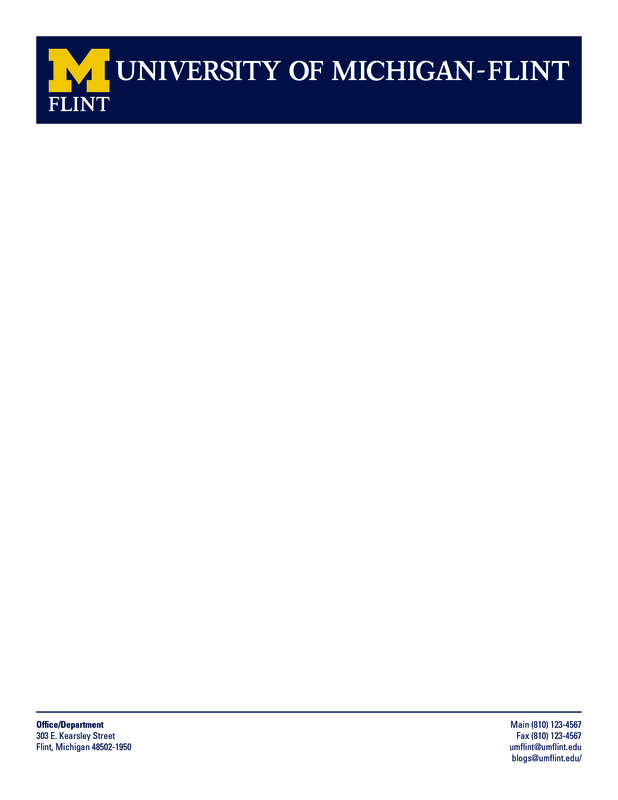 UM-Flint employees can determine what information they would like to appear on the cards. The design templates are a guide for where the text should appear. There are two stationery designs. One has the university wordmark at the top, with the recommendation that it be used for all external communication when it is important to represent the university, not just a department. The second design has the department logo at the top, with the recommendation that it be used internally or for communication where the department information is the priority. Departments should have a supply of both if possible. 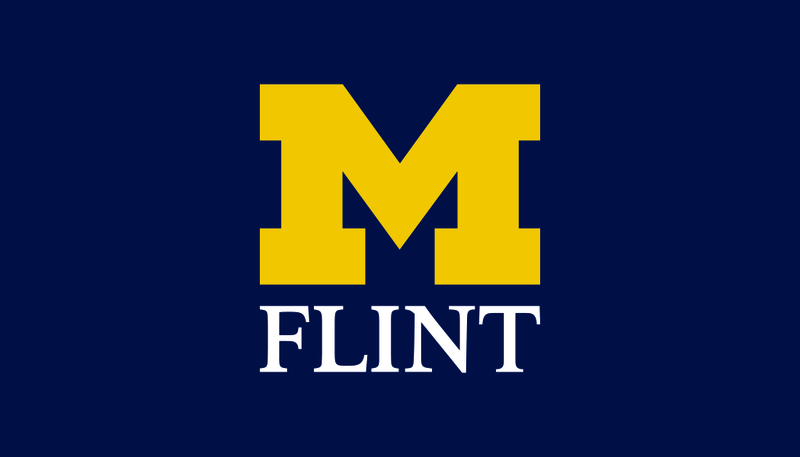 If your budget only allows for one, we recommend the University of Michigan-Flint wordmark version. One envelope design that can be used with either stationery version.